"Wobbegong sharks are now increasingly rare"
Michael McFadyen's Scuba Diving - Merimbula Wharf The New South Wales Far South Coast town of Merimbula is one of the prettiest towns in Australia. Blessed with beautiful beaches and a hinterland of outstanding forests, the town has eveything going for it. In the late 1800s, the only access to the town was via ship. Around this time a wharf was built to enable the ships to load and unload passengers and freight. This wharf was used till the mid-1900s. Other places in NSW have or had similar wharves (Tathra, Coffs Harbour). 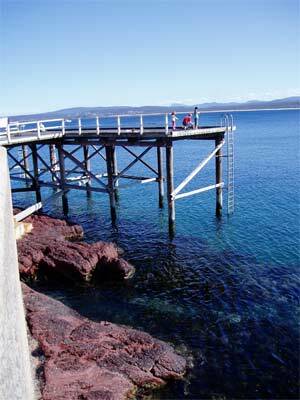 The Merimbula Wharf is located on the northern side of Merimbula Bay. From Sydney, it is about a 450 kilometre drive which takes at least five and a half hours drive and more like six hours. Once you arrive in the town, turn left when the Princes Highway makes a right angle turn in the centre of the town. Then turn right and follow this road out to the wharf. The way is well sign-posted. At the end of the road you come to the Merimbula Wharf. There is a restaurant and aquarium in the building you see and there is a decent parking area. Park as close to the southern end of the road as you can. When you get out of the car, look over the wall ahead and you will see the entry and exit point. To your left you will see a small gap between the wall and building. At the end there is a couple of steps. This gives access over the wall to the rock platform. It is an easy walk across the rock to the small point that you will see from the wharf area. Gear up and walk out to the point. You can do a giant stride on the western side. Note the southern side has a sloping rock that gives a good exit point. Once in the water, drop to the bottom and head west. You will go over a wall to six and then 7.5 metres. The reef runs roughly north-south. Turn right to the north and follow this depth. After a few minutes you will see a couple of plastic water/sewerage pipes. Thes used (or used to be?) to draw water for the aquarium. You will notice that the pipes are covered in many places by bags of concrete. There are literally hundreds of bags. I wonder whether these bags were part of a storage of cement bags that got somehow wet and were then reused here or if they were put here when dry. I suspect that it is the former as this would be a very expensive way to create a heavy object to weigh down something. Far cheaper to make concrete blocks. 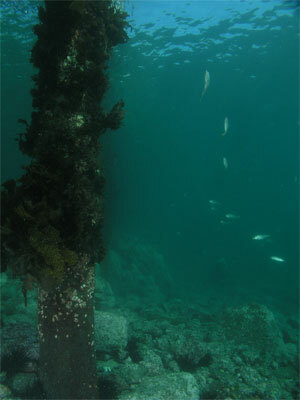 There are also a few pieces of the old wharf lying on the bottom, pylons and other timbers. 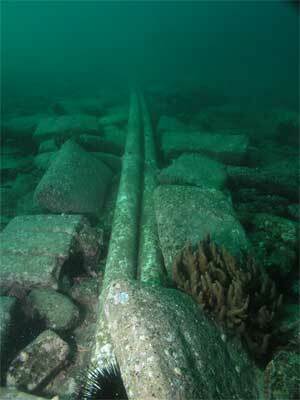 Follow this pipe to the north-west and you will come to the wharf. If there are a lot of people fishing off the wharf (and there normally are), it is best to not go too far out from the wharf as you will both upset the fishers and possibly get tangled in their lines. When you get within sight of the wharf, head straight to the wharf. It is pretty shallow here, no more than four metres. There is not a lot of growth here, in fact the rocks are pretty bare. I have only dived this site twice, once in January 1989 and again in October 2005. From what I remember, the first dive had pretty good fishlife under the wharf whereas the second one was quite devoid of fish. However, many people have told me that the area under the wharf still has good fishlife at times. Swim under the wharf to the north and out the other side. The depth increases slightly. Note that one of the first pylons you pass has strapped to it what appears to be a stainless steel filter attached to the end of a pipe. I assume that this is or was the water inlet for the aquarium. It is said that this area has a resident bullray. There are also some blue gropers and a few yellowtail. From here swim back along the outside of the wharf (but not too far if there are people fishing). When you see the pipe, follow it again. Keep going till you reach the end. The depth here will be 10 metres. Head west and you will soon drop over a wall to another sand edge. The depth here is 14 metres. On the sand is a very unusual object. It is a track from a bulldozer or similar construction vehicle. I wonder who put it here and why? From here follow this small wall to the south. The depth increases slightly as you go, but does not get much past 15 metres. The marine life here is much better than the first part of the dive. There are many more gorgonias and sponges. The fishlife is also a little better (at least on my most recent dive). Continue along the wall till you have decided that you need to return to the shore. You can either return back to the track and then head east to the exit spot or you can turn east and go up till you get in the five to seven metres area. Then head north for a period of time equivalent to your swim from the track. Once back in the vicinity of the exit point, surface and check out your location. You should see the sloping rock nearby. Swim up onto the rock using an incoming wave. Crawl up higher before removing your fins. Return back to the car the same way you came down. 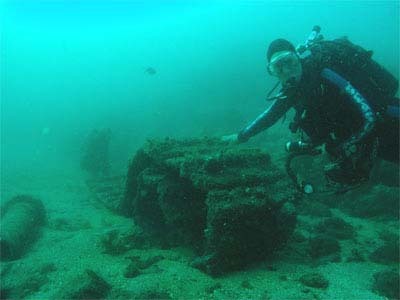 This dive is recommended to do after the SS Empire Gladstone or if you arrive early for a weekend of diving in the area. In my experience it is not a great dive, but can be okay. Note that this dive is not for when southerly seas or winds are up but is especially good when north-easterlies are blowing. Water temperature ranges from 12° to 20°. Visibility is said to be normally quite good, but as it is closer to a major inlet of water, it can get dirty after periods of rain and outgoing tides.